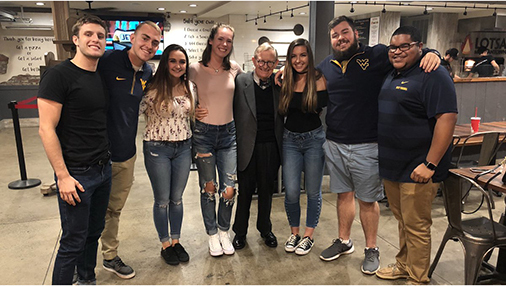 WVU Day of Giving 2018 has ended! Student Organizations has raised $ 6,734 from 86 gifts! Your support for the student organizations below helps our students take on new challenges and experiences. Your support allows students to have the courage to try new things. To be bold in their convictions. To leave things better than when they found them. That is what being a Mountaineer looks like for our students. You can make a difference. WVU Day of Giving is live! Help us kick off the 2018 WVU Day of Giving by making a gift to your favorite area of WVU. Gifts will be matched dollar for dollar up to a total of $50,000. Calling all WVU Faculty and Staff! Kick off the work day by donating on WVU Day of Giving. Gifts made by WVU faculty and staff will be matched dollar for dollar up to a total of $10,000. The next $10,000 in donations made by First Time Donors will be matched dollar for dollar. Make your first ever donation to WVU now and get your gift matched. WVU Day of Giving "Afternoon Power Push"
Gifts made during the “Afternoon Power Push” will be matched dollar for dollar up to a total of $50,000. Help us meet this match by making a gift to your favorite area of WVU! The next $10,000 in donations made by Recent Graduates (2009-2018) will be matched dollar for dollar. Make your donation to WVU now and get your gift matched. Let’s keep going! Help us meet another dollar-for-dollar match by making a gift to your favorite area of WVU. Gifts will be matched dollar-for-dollar up to a total of $25,000. We have one more match to offer tonight as our Day of Giving heads into its final stretch. Gifts made until 11:30 will be matched 2-for-1 up to a total of $50,000. The first 1,000 gifts of $100 or more will be matched up to $100 each helping us raise an extra $100,000 for Day of Giving. Help us unlock this $100,000 by making a gift of $100 or more! The $100 match to your gift will be made once the challenge is met! Which Participating Group will receive the most donations during our Lunch Time Challenge? The group that receives the most donations during this challenge will receive an extra $2,500 for their Greatest Needs Fund. Which Participating Group will receive the most donations during our Happy Hour Challenge? The group that receives the most donations during this challenge will receive an extra $2,500 for their Greatest Needs Fund! Which Participating Group will receive the most donations during our Night Owl Challenge? The group that receives the most donations during this challenge will receive an extra $2,500 for their Greatest Needs Fund. Which Participating Group will receive the most donations during WVU Day of Giving? Make a gift to your favorite area of WVU to help keep your group at the top of the Leaderboard. Which Participating group will raise the most during WVU Day of Giving? Make a gift to your favorite area of WVU to help keep your group at the top of the Leaderboard! If 2,000 WVU alumni, students, faculty, staff and friends share their favorite photos with the WVU Mountaineer (from any year!) on social media then Mike Escue and Alexis Pugh will generously donate an additional $20,000 to benefit WVU students. Help us meet this challenge by sharing your photo and use #WVUDayofGiving. A very generous donor has agreed to contribute a total of $2,500 to the top 3 Student Organizations ($1,600 1st, $600 2nd, $300 3rd), that receive the most donations on the Day of Giving. Choose your favorite Student Organization, make your gift, and be sure to follow the Leaderboard! Or you can contact us at dayofgiving@wvuf.org.